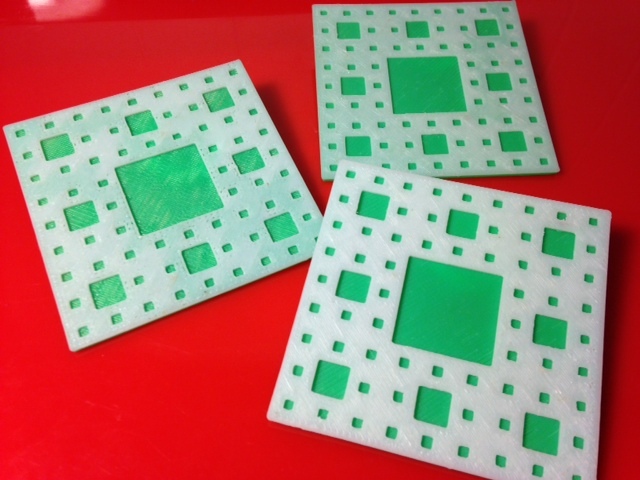 It's hard to 3D-print a Level 3 Menger sponge. But it isn't hard to print a slice of one, and it makes for a decent coaster. Settings: Afinia MakerWare at .3mm resolution, fast setting, with a raft, in about 34 minutes. Technical notes: With the Afinia and settings as above, this model prints a raft in layers 1-7, the green base in layers 8-10, and the white Menger slice in rows 11-13. You can pause the Afinia 3D software and switch the filament color at the start of row 11. In the picture only the closest coaster was printed that way; the other two coasters were thinner with less rows in both the Menger and base layers. It looks a lot better with more layers. Stuff you might want to change: You can print these without the colored backgrounds, if you don't really care much about your table and just want coasters for fun.